This Electrical Part (Chapters 34 through 43) is produced and copyrighted by the National Fire Protection Association (NFPA) and is based on the 2011 National Electrical Code® (NEC®) (NFPA 70®-2011), copyright 2010, National Fire Protection Association, all rights reserved. Use of the Electrical Part is pursuant to license with the NFPA. The title National Electrical Code®, the acronym NEC® and the document number NFPA 70® are registered trademarks of the National Fire Protection Association, Quincy, Massachusetts. See Appendix Q, International Residential Code Electrical Provisions/National Electrical Code Cross Reference. This Electrical Part is a compilation of provisions extracted from the 2011 edition of the NEC. The NEC, like all NFPA codes and standards, is developed through a consensus standards development process approved by the American National Standards Institute. This process brings together volunteers representing varied viewpoints and interests to achieve consensus on fire and other safety issues. While the NFPA administers the process and establishes rules to promote fairness in the development of consensus, it does not independently test, evaluate or verify the accuracy of any information or the soundness of any judgments contained in its codes and standards. The provisions of Chapters 34 through 43 shall establish the general scope of the electrical system and equipment requirements of this code. Chapters 34 through 43 cover those wiring methods and materials most commonly encountered in the construction of one- and two-family dwellings and structures regulated by this code. Other wiring methods, materials and subject matter covered in NFPA 70 are also allowed by this code. Chapters 34 through 43 shall cover the installation of electrical systems, equipment and components indoors and outdoors that are within the scope of this code, including services, power distribution systems, fixtures, appliances, devices and appurtenances. Services within the scope of this code shall be limited to 120/240-volt, 0- to 400-ampere, single-phase systems. These chapters specifically cover the equipment, fixtures, appliances, wiring methods and materials that are most commonly used in the construction or alteration of one- and two-family dwellings and accessory structures regulated by this code. The omission from these chapters of any material or method of construction provided for in the referenced standard NFPA 70 shall not be construed as prohibiting the use of such material or method of construction. Electrical systems, equipment or components not specifically covered in these chapters shall comply with the applicable provisions of NFPA 70. 2. Services over 400 amperes. Any addition or alteration to an existing electrical system shall be made in conformity to the provisions of Chapters 34 through 43. Where additions subject portions of existing systems to loads exceeding those permitted herein, such portions shall be made to comply with Chapters 34 through 43. E3402.2 Penetrations of fire-resistance-rated assemblies. Electrical installations in hollow spaces, vertical shafts and ventilation or air-handling ducts shall be made so that the possible spread of fire or products of combustion will not be substantially increased. Electrical penetrations into or through fire-resistance-rated walls, partitions, floors or ceilings shall be protected by approved methods to maintain the fire-resistance rating of the element penetrated. 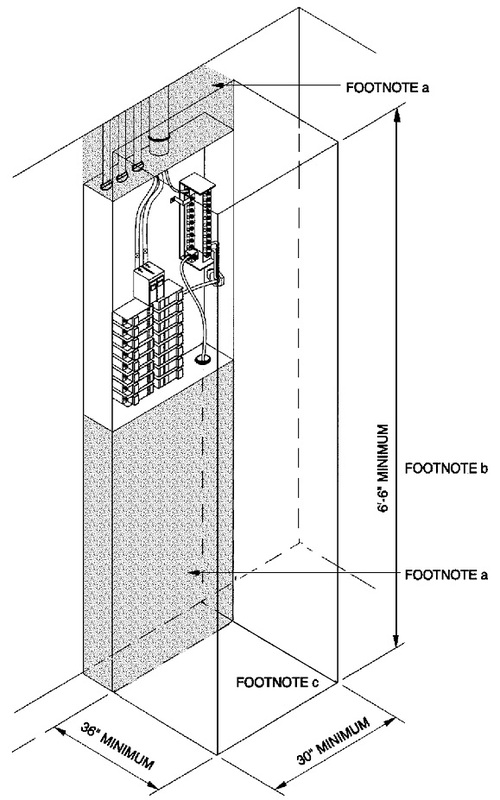 Penetrations of fire-resistance-rated walls shall be limited as specified in Section R317.3. E3402.3 Penetrations of firestops and draftstops. Equipment intended to interrupt current at fault levels shall have a minimum interrupting rating of 10,000 amperes. Equipment intended to interrupt current at levels other than fault levels shall have an interrupting rating at nominal circuit voltage of not less than the current that must be interrupted. The overcurrent protective devices, total impedance, equipment short-circuit current ratings and other characteristics of the circuit to be protected shall be so selected and coordinated as to permit the circuit protective devices that are used to clear a fault to do so without extensive damage to the electrical equipment of the circuit. This fault shall be assumed to be either between two or more of the circuit conductors or between any circuit conductor and the equipment grounding conductors permitted in Section E3908.8. Listed equipment applied in accordance with its listing shall be considered to meet the requirements of this section. Enclosures, other than surrounding fences or walls, of panelboards, meter sockets, enclosed switches, transfer switches, circuit breakers, pullout switches and motor controllers, rated not over 600 volts nominal and intended for such locations, shall be marked with an enclosure-type number as shown in Table E3404.4. Note 1: The term raintight is typically used in conjunction with Enclosure Types 3, 3S, 3SX, 3X, 4, 4X, 6 and 6P. The term rainproof is typically used in conjunction with Enclosure Types 3R and 3RX. The term watertight is typically used in conjunction with Enclosure Types 4, 4X, 6 and 6P. The term driptight is typically used in conjunction with Enclosure Types 2, 5, 12, 12K and 13. The term dusttight is typically used in conjunction with Enclosure Types 3, 3S, 3SX, 3X, 5, 12, 12K and 13. Note 2: Ingress protection (IP) ratings are found in ANSI/NEMA 60529, Degrees of Protection Provided by Enclosures. IP ratings are not a substitute for enclosure-type ratings. Equipment not identified for outdoor use and equipment identified only for indoor use, such as “dry locations,” “indoor use only” “damp locations,” or enclosure Type 1, 2, 5, 12, 12K and/or 13, shall be protected against damage from the weather during construction. Unused openings, other than those intended for the operation of equipment, those intended for mounting purposes, and those permitted as part of the design for listed equipment, shall be closed to afford protection substantially equivalent to the wall of the equipment. Where metallic plugs or plates are used with nonmetallic enclosures they shall be recessed at least 1/4 inch (6.4 mm) from the outer surface of the enclosure. E3404.7 Integrity of electrical equipment. E3404.9 Energized parts guarded against accidental contact. E3404.12 Identification of disconnecting means. E3405.1 Working space and clearances. b. The working space shall be clear and unobstructed from the floor to a height of 6.5 feet or the height of the equipment, whichever is greater. e. Such work spaces shall be provided with artificial lighting where located indoors and shall not be controlled by automatic means only. E3405.2 Working clearances for energized equipment and panelboards. Except as otherwise specified in Chapters 34 through 43, the dimension of the working space in the direction of access to panelboards and live parts likely to require examination, adjustment, servicing or maintenance while energized shall be not less than 36 inches (914 mm) in depth. Distances shall be measured from the energized parts where such parts are exposed or from the enclosure front or opening where such parts are enclosed. In addition to the 36-inch dimension (914 mm), the work space shall not be less than 30 inches (762 mm) wide in front of the electrical equipment and not less than the width of such equipment. The work space shall be clear and shall extend from the floor or platform to a height of 6.5 feet (1981 mm) or the height of the equipment, whichever is greater. In all cases, the work space shall allow at least a 90-degree (1.57 rad) opening of equipment doors or hinged panels. Equipment associated with the electrical installation located above or below the electrical equipment shall be permitted to extend not more than 6 inches (152 mm) beyond the front of the electrical equipment. 1. In existing dwelling units, service equipment and panelboards that are not rated in excess of 200 amperes shall be permitted in spaces where the height of the working space is less than 6.5 feet (1981 mm). 2. Meters that are installed in meter sockets shall be permitted to extend beyond the other equipment. Meter sockets shall not be exempt from the requirements of this section. E3405.4 Location of working spaces and equipment. E3405.5 Access and entrance to working space. Artificial illumination shall be provided for all working spaces for service equipment and panelboards installed indoors and shall not be controlled by automatic means only. Additional lighting outlets shall not be required where the work space is illuminated by an adjacent light source or as permitted by Exception 1 of Section E3903.2 for switched receptacles. E3406.3 Minimum size of conductors. Where installed in raceways, conductors 8 AWG and larger shall be stranded. A solid 8 AWG conductor shall be permitted to be installed in a raceway only to meet the requirements of Sections E3610.2 and E4204. Circuit conductors that are connected in parallel shall be limited to sizes 1/0 AWG and larger. Conductors in parallel shall: be of the same length; consist of the same conductor material; be the same circular mil area and have the same insulation type. Conductors in parallel shall be terminated in the same manner. Where run in separate raceways or cables, the raceway or cables shall have the same physical characteristics. Where conductors are in separate raceways or cables, the same number of conductors shall be used in each raceway or cable. E3406.7 Conductors of the same circuit. E3406.8 Aluminum and copper connections. Connectors and terminals for conductors that are more finely stranded than Class B and Class C stranding as shown in Table E3406.9, shall be identified for the specific conductor class or classes. a. Number of strands vary. b. Aluminum 14 AWG (2.1 mm2) is not available. c. With the permission of Underwriters Laboratories, Inc., this material is reproduced from UL Standard 486A-B, Wire Connectors, which is copyrighted by Underwriters Laboratories, Inc., Northbrook, Illinois. While use of this material has been authorized, UL shall not be responsible for the manner in which the information is presented, nor for any interpretations thereof. E3406.11.3 Length of conductor for splice or termination. Insulated grounded conductors of sizes 6 AWG or smaller shall be identified by a continuous white or gray outer finish or by three continuous white stripes on other than green insulation along the entire length of the conductors. Conductors of sizes 4 AWG or larger shall be identified either by a continuous white or gray outer finish or by three continuous white stripes on other than green insulation along its entire length or at the time of installation by a distinctive white or gray marking at its terminations. This marking shall encircle the conductor or insulation. 1. An insulated conductor that is part of a cable or flexible cord assembly and that has a white or gray finish or a finish marking with three continuous white stripes shall be permitted to be used as an ungrounded conductor where it is permanently reidentified to indicate its use as an ungrounded conductor at all terminations and at each location where the conductor is visible and accessible. Identification shall encircle the insulation and shall be a color other than white, gray, and green. Where used for single-pole, 3-way or 4-way switch loops, the reidentified conductor with white or gray insulation or three continuous white stripes shall be used only for the supply to the switch, not as a return conductor from the switch to the outlet. E3407.4.2 Receptacles, plugs and connectors.